SHELTON, CT., January 24, 2013 — Summit Golf Brands today announced the debut of the Fall 2013 apparel collection at the PGA Merchandise Show in Orlando, Florida. 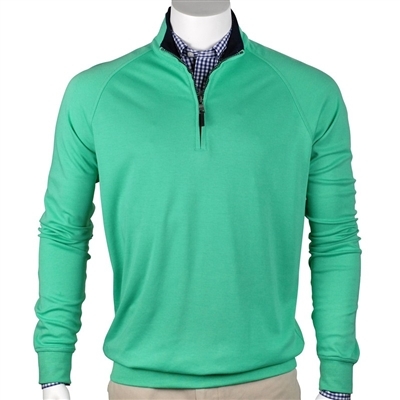 The Company’s apparel brands include Fairway & Greene, EP Pro, and Zero Restriction. Summit Golf Brands also announced the introduction of EP Sport, a spirited collection of cross-functional separates for the active woman and a brand extension of EP Pro, and B. Draddy, an updated, all-cotton-based line aimed at the younger golfer. B. Draddy does much the same thing for the men’s market. “With its exciting blend of traditional styles, slimmer silhouettes, and unexpected fabrics, B. Draddy gives golfers clothes he can wear with equal confidence on the course or off,” said Heyn. Of particular note are brilliantly colored shirts and horizontally striped seersucker shorts. More information on the EP Pro and EP Sport lines can be found at http://www.fairwayan….com/press.html. The Cosmopolitan Collection, a modern twist on traditional with a palette of classic Black and White, complemented by Cosmo Red, in edgy polka dots and a modified contemporary houndstooth. The Tech Collection draws from the neon looks that were a hallmark of ‘80s fashion. The twist is subduing bright Yellows and Pinks with deep Marine and clean White. A full zip Windsweater, and vibrant new colors for the Cave quarter zip. The Windsweater’s lining from the wind while allowing freedom to swing. New fabrics for the Ocean Reef Collection include a combination of natural fibers and yarns made into a double-knit with extra body minus added weight. The McCallan Cashmere V Neck, our performance cashmere blend with a modern cricket silhouette, and the 100% cotton Luxe touch herringbone quarter zip, washed to give it the feel of cashmere, are notable additions to Ocean Reef. The Duke Collection draws its name from the stylish Duke of Windsor, its palette from ancient Scottish tartans, and patterns from English and Scottish knitwear. Lightweight Italian merino wool makes these traditional pieces contemporary and functional. The American Golfer Collection, named for an early 20th century golf publication, features rich colors inspired by the look of the magazine in modern fabrics, including a stretch that is strictly 21st century. The stretch comes from a unique process where a polymer is added during spinning and then removed when the yarn is washed, leaving a microscopic channel that creates the stretch and comfort. All F &G collections feature new packaging: an updated logo, labels, and hangtags. Two new wind fabrics are featured: a water resistant knit outer layer bonded to a Windproof membrane and textured mesh (Jackie) and a water-resistant knit outer layer bonded to Windproof membrane and soft shell fleece lining (Nadia). Lifestyle pieces have been added to the collection: the Babe yoga pant and the Laila lightweight stretch hoodie. Feminine silhouettes and details have been added throughout the collection, most notable in our Snakeskin print wind jacket, which adds a high-fashion element to the technical performance Zero Restriction is known for. The Revolution Shoulder allows you to get the most out of your swing, thanks to the shoulder seam being placed above the cap of the shoulder with a convex seam, mirroring the contour between the chest and the arm. The Power Torque Back is an advance in our Power Torque Technology, where we “map” the body and then use different fabrics in specific locations of the garment, allowing for increased flexibility of the fabric, comfort, and fit. The Power Torque Back can be found in the Knollwood, Pinnacle, and Power Torque Packable jackets. Summit Golf Brands creates premium golf and sportswear for the discerning customer. Their array of brands enhances and enriches their lifestyles, both on and off the course. The power and range of Summit Golf Brands allows them to attract some of the most talented people who are the face of golf today. Visit Summit Golf Brands at http://www.summitgolfbrands.com/. Zero Restriction and Fairway & Greene men’s outerwear sale in all colors and sizes up to 3XL. Our best golf brands worn on every major pro golf tour at our lowest holiday promo prices ever. You don’t have to be a golfer to enjoy the comfort of these quality jackets, pullovers, and tech wear. Optionally add custom logo embroidery for a great executive gift. Here’s a list of the in stock items. Hurry for the best size and color selections. Zero Restiction Men's Highland Jacket is a soft alernative to traditional golf windwear, with windproof, breathable fabric, designed to provide freedom to swing. Waterproof membrane. ABOUT ZERO RESTRICTION: Zero Restriction, founded in 1991, started by making waterproof rainwear for golfers. Players on all three professional tours saw the advantages of ZR, and orders started pouring in. Today ZR continues to set new standards in golf apparel, using innovative technology and patented features to enhance freedom of motion without restriction, something that is crucial for all golfers and sports enthusiasts. The Association of Golf Merchandisers (AGM), an industry group of the best shops at golf resorts and country clubs, recently ranked Zero Restriction as the Top Outerwear Brand at Private Clubs. PGA magazine also consistently ranks Zero Restriction as a top seller every month in their publication. From avid golfer to seasoned Tour Pro, Zero Restriction provides comfort in any weather through the thoughtful design of the world’s finest golf outerwear and performance apparel. Full freedom of movement and protection from the elements since 1991. Known for innovative Gore-Tex® rainwear with Gore’s “Guaranteed to keep you Dry” ® promise. Patented Motion-Tuned features for golf comfort and unhindered swing in rain and wind. Tour-proven performance in all conditions.